Ready for a weekend escape? Experience the best of Boulder in just two days. Adventures in the great outdoors, craft beers on casual patios, award-winning restaurants and theatrical performances await. Start your day with a quick, casual breakfast before heading out to commune with nature. Stop by the cozy Ozo Coffee Company on Pearl Street, Boulder’s pedestrian shopping district, for a cup of freshly roasted organic coffee, or pull up a chair in the airy, contemporary space at Alpine Modern Café, where wholesome choices like avocado tartine and quinoa porridge provide the perfect fuel for an active day. Just a few minutes away, you’ll find Chautauqua Park, a peaceful green leading to the dramatic rock formations of the Flatirons, slanting slabs of sandstone named by early pioneer women for their resemblance to the flat metal irons they used to press their clothing. Hike one of the trails that leave from Chautauqua Trailhead, such as Woods Quarry (easy), Second-Third Flatiron Trail (moderate) or Royal Arch (difficult). For mountain bikers looking to shred some singletrack, explore the mild-grade trails at Marshall Mesa, where wide-open skies and views promise an iconic Boulder experience. After an active morning, kick back with a healthy, hearty lunch. Enjoy colorful, seasonal salads and freshly made Italian specialties at Arugula Bar e Ristorante, fill up on hearty vegan and vegetarian entrees at Leaf Vegetarian Restaurant, or grab a gourmet sandwich piled high with locally sourced, organic ingredients at Naked Lunch or Organic Sandwich Company. After lunch, walk a few blocks north of downtown to the new Museum of Boulder, where you can hear locals’ insights about how Boulder came to be … Boulder. Plus, check out big-name exhibits like Da Vinci Machines and Sportology. Or opt to drive just north of Boulder to take the free, guided tour at nearby Celestial Seasonings tea factory, one of the largest in North America. Also in the neighborhood is Avery Brewing Co., where you can sample an impressive lineup of craft beers and take a free, self-guided tour of the brewery. For a casual dinner, revive with a cold beer and fall-off-the-bone barbecue at West End Tavern, or order flavorful Mexican specialties and salty margs on the rooftop patio at Rio Grande Mexican Restaurant. Mingle with local college students and music fanatics at a live concert at Fox Theatre or catch a show downtown at the revered Boulder Theater, and then keep the party going with late-night dancing at Tahona Tequila Bistro (Fridays and Saturdays, 10pm–close). After a day of casual dining and outdoor fun, treat yourself with a few of Boulder’s cultural delights. Take your pick from relaxing ways to start your day. Unwind in the tranquil steam rooms and saunas at the Spa at St. Julien before a therapeutic massage or sumptuous body treatment. Feel invigorated with a yoga class at one of the many studios in Boulder, such as Yoga Loft (which boasts om-inspiring views of the Flatirons), Yoga Pod (more views in a beautiful space) or CorePower (with invigorating options like Hot Power Fusion and CoreCardio Circuit). 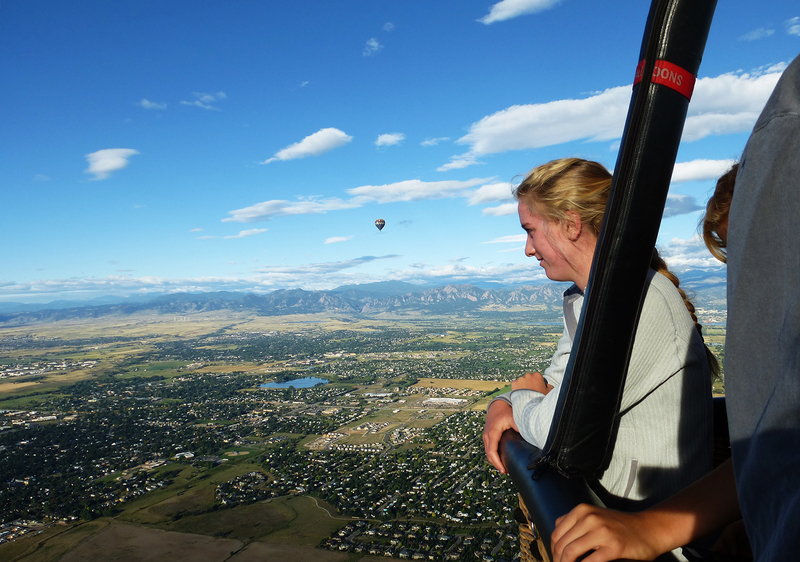 Or to take your day to new heights with a sunrise hot-air balloon ride overlooking the Rocky Mountains, Colorado’s Front Range and the Boulder Valley. Continue your relaxing day with a leisurely brunch at Brasserie Ten Ten, a bustling French bistro serving up delicate crepes, house-made pastries, fresh seafood dishes and ice-cold oysters. Or, linger over a cup of tea and unique global cuisine at the Boulder Dushanbe Teahouse, a cultural escape featuring hand-carved wooden accents and colorful paintings. Another great option is Chautauqua Dining Hall, where wholesome Colorado bistro fare and locally brewed craft beers are served in a historic setting at the foot of the Flatirons. Let brunch settle by strolling around the shops of downtown’s Pearl Street, a brick-paved, pedestrian stretch of quaint boutiques and specialty shops. Savor outrageously decadent sweets at Piece, Love & Chocolate, stock up on everyday and exotic spices at Savory Spice Shop, browse natural body products at Rebecca’s Herbal Apothecary & Supply, find your next great read at Boulder Book Store or pick out the perfect outfit at Weekends. Another great option for shop-till-you-drop types is Twenty Ninth Street, an open-air retail district offering well-known brand names such as Anthropologie, Apple, The North Face, Lululemon and J Jill. Be sure to stop in the West Elm store, featuring products from local makers. Ready to take a break from shopping? There's a new outdoor beer garden at Twenty Ninth Street called The Barrel, perfect for sampling Boulder beers. Or head to North Boulder's warehouse district for a little wine tasting at Boulder Wine Studios, featuring three local wineries: Bookcliff Vineyards, Settembre Cellars and Decadent Saint. For dinner, take your pick of celebrated chefs and elegant restaurants in Boulder’s fine dining scene. Indulge in exquisite Northern Italian fare and expertly paired wines with the tasting menu at Frasca Food and Wine, or revel in fresh sushi and seasonal Japanese dishes at Izakaya Amu. At Arcana, creative American fare is reinterpreted with global influences, and its cocktail menu boasts craft spirits and unexpected ingredients. Or take in incredible mountain views at the historic Flagstaff House Restaurant, a longtime special occasion restaurant poised on a perch above the city. Finally, immerse yourself in Boulder’s arts and culture scene by enjoying an evening of classical music by the Boulder Philharmonic Orchestra or Boulder Symphony. For dance, theater, art cinema and more, check the events schedule at The Dairy Arts Center. Want more? Find more ideas in these suggested itineraries.